When are tolls worth it? Everyday, more than 51,000 drivers choose to use the I-405 express toll lanes. Drivers tell us they like having the choice for a faster trip when they really need it but sometimes it's hard to tell exactly how much time you're saving because toll rates change in confusing ways. Why do toll rates change? Toll rates manage traffic in the express toll lanes based on real-time traffic conditions. Every five minutes, the traffic management computer system updates toll rates based on how many cars are in the express toll lanes and how fast they are going. The goal is to use the laws of supply and demand to keep traffic moving. When traffic is flowing smoothly and there is plenty of room in the express toll lanes, the price is low. When the lanes start to fill up and slow down, the price goes up in order to discourage too many cars from getting in so that traffic in the lanes can keep flowing smoothly. Tolls can reach $10 when congestion is heavy. For most people, $10 is only worth it when you're in a rush to something really important but is too much to spend every day. We understand that, and that's what makes it all work. When traffic is at its worst, higher tolls help traffic so that these lanes can move as many people as possible without jamming up. That's how we make sure that you have a dependable way out of traffic when you really need it. Time is money, so exactly how much time do you save when you pay to use the express toll lanes? Do you get a deal when the tolls are high or low? We crunched the numbers and it turns out the more you pay, the more time you will probably save. When tolls are at $1 drivers save an average of 5 minutes compared to the regular lanes on trips between Bellevue and Lynnwood. 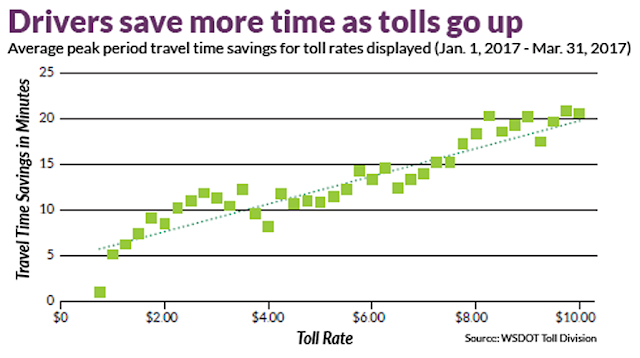 Time savings add up pretty consistently when toll rates go up, and for every dollar the toll rate increases drivers save about another minute and a half. When tolls are at $10, drivers save about 20 minutes on average. The average toll people are paying during peak periods is $3.29. Drivers are saving an average of 11 minutes heading south in the mornings, and 14 minutes heading north in the afternoons. Sometimes there are slow spots but you can save a lot of time overall on the full trip. 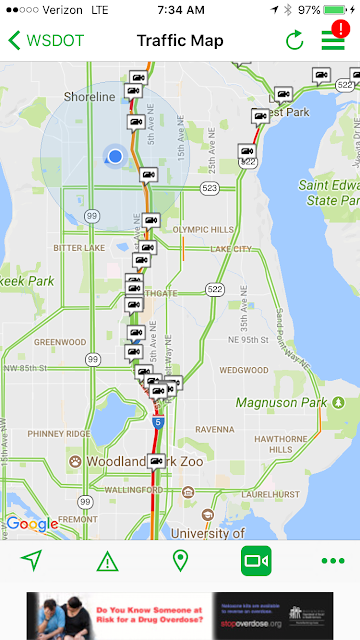 To do this math, we looked at how much time drivers saved for a trip all the way between Bellevue and Lynnwood. We also only looked at data for the peak times of day. The graph below shows the average minutes saved on full corridor trips during peak periods compared to the rates displayed during those trips. It is frustrating spending $10 and then hitting a slow spot in the express toll lanes. If that's happened to you, you're probably feeling a little skeptical right now. But remember, high toll rates mean that the express toll lanes have started to get crowded and we're trying to keep it under control. On average, express toll lanes move about 19-24 miles per hour faster than the regular lanes at peak times. That doesn't mean there's never a slow spot, but overall these lanes run way more smoothly than the old HOV lanes did a few years ago. We try to keep things moving at around 45 miles per hour, because that's the most efficient speed for moving the most cars at a time. When traffic is at its worst, each express toll lane can carry up to 30 percent more cars than a regular lane in some locations at the height of the peak commute relieving some pressure on the regular lanes. So even on the days when the toll isn't worth it to you, at least you know that it's freeing up some space in the regular lanes around you when other drivers choose to pay. Many see Labor Day weekend as the last big travel weekend of the summer, before the kids head back to school and the weather starts to turn nasty. 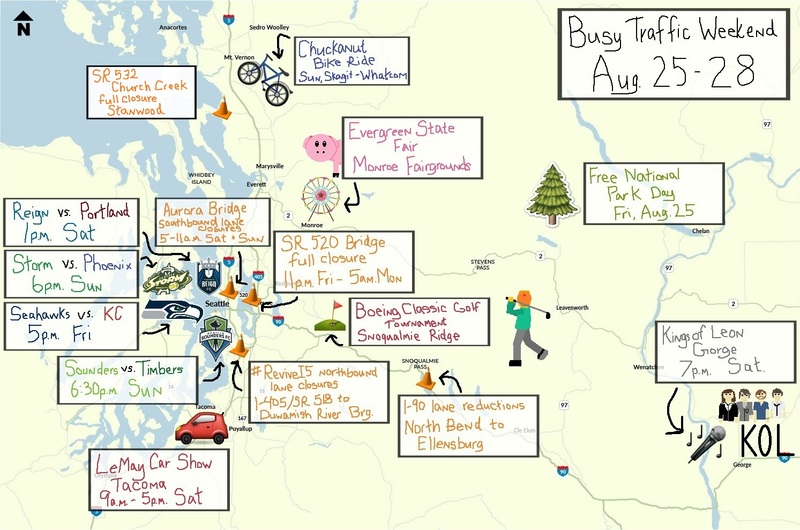 With major events happening on both sides of the state, we expect traffic to be heavy on all our key mountain pass routes, as well as the I-5 corridor. 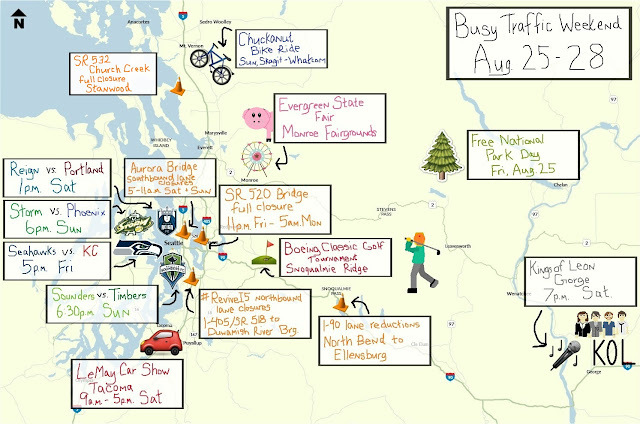 Our latest Microsoft Paint map gives you an idea of how jam-packed the roads will be this weekend. Not to sound like a broken record, but if you’re heading out for one last summer hoorah this weekend, PLAN AHEAD! We have several resources that help you know what is happening on the roads before you leave the house. We’ll be posting closures and updates on those platforms throughout the holiday weekend to help you #KnowBeforeYouGo. For the best times to travel this weekend, check out our traffic volume charts to help plan your trip. 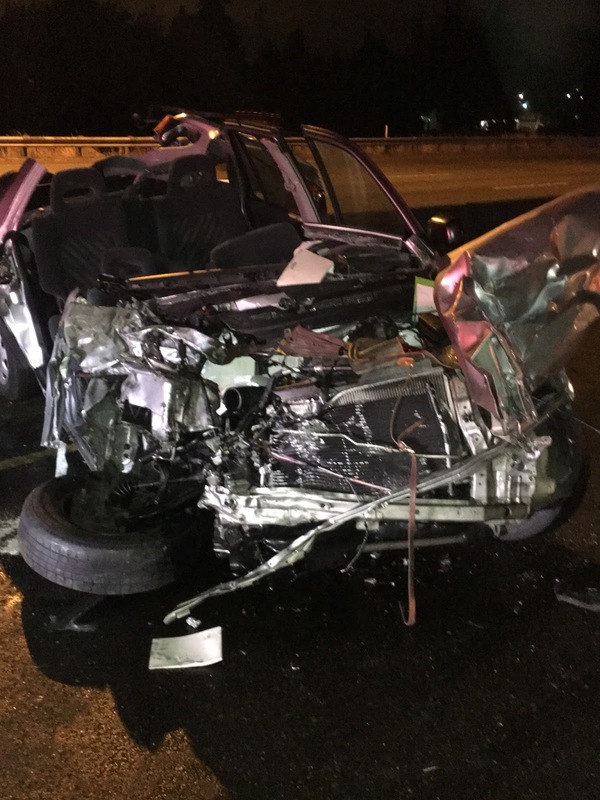 A tragic collision early Wednesday morning in Parkland led to a close call for one of our Incident Response Team workers. While helping with traffic control at a fatality collision Wednesday morning, our IRT truck was struck by a driver believed to be impaired. At about 2:30 a.m., the driver of a semi truck pulled over to the gore point on eastbound SR 512 at SR 7 to check the GPS. 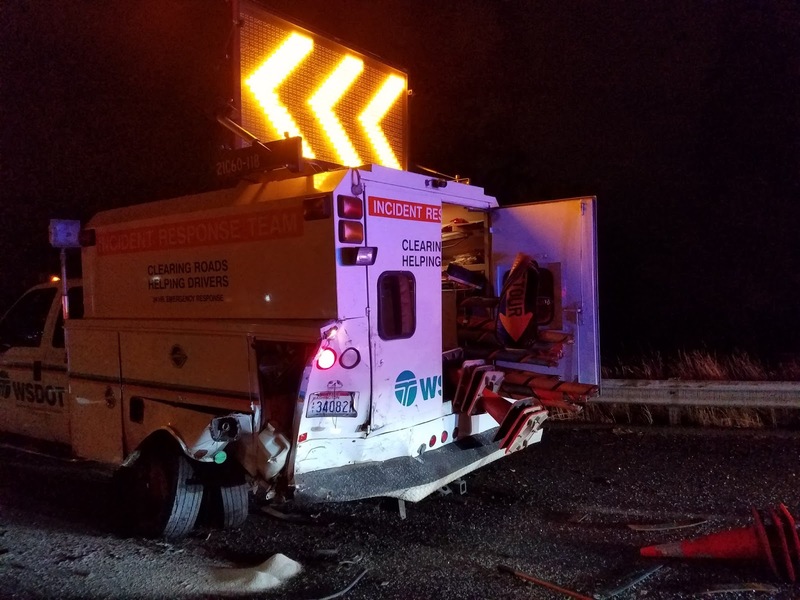 Another driver then ran into the back of the semi truck at high speed without braking, according to the Washington State Patrol. The driver of the vehicle that hit the semi died from the crash injuries. Fortunately, our IRT worker avoided being struck Wednesday morning by jumping over the barrier. Meanwhile, our IRT worker arrived at the scene to set up traffic control and was setting up a sign just west of the crash. She noticed a vehicle headed at her at a high rate of speed and jumped over the barrier to avoid getting hit. That vehicle ran into our IRT truck and the driver was arrested for vehicular assault and is under suspicion of driving under the influence. That driver had minor injuries and her passenger was in critical condition with a broken femur. was in critical condition with a broken femur. Our thoughts go out to everyone involved in these crashes and we are incredibly thankful that our employee and the rest of the emergency responders escaped uninjured. Our state averages 850 roadway work zone injuries every year. In 96 percent of those cases, those injured are not the workers, but the other driver, their passenger or pedestrians. Labor Day weekend is coming up and while most of our construction projects will be shut down for the holiday, there will be lots of traffic out there, and lots of emergency responders, including the State Patrol, fire department, tow trucks and, yes, our IRT, out helping people. 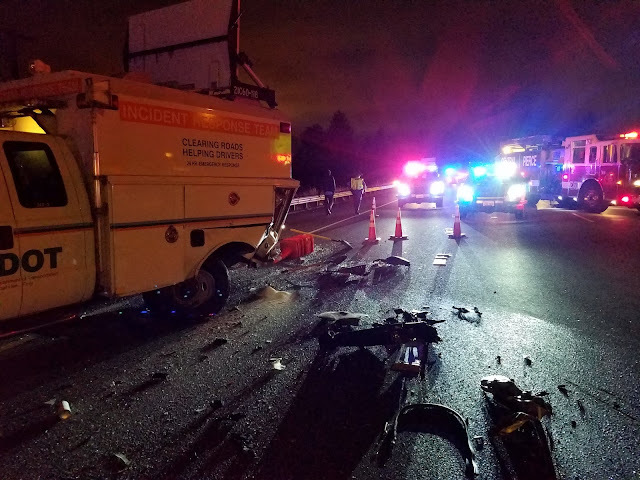 It’s so important for drivers to make smart decisions on the highway, drive sober, focus on the road and give those road workers plenty of room to do their jobs. They are working to keep people safe and traffic moving and we want all of them to go home safely to their families. Labor Day weekend is the last gasp of summer for most people and it is a very busy travel weekend on state highways. In particular, we see a huge surge in traffic over our mountain passes, including I-90. Because of several construction projects over I-90 this summer, we’ve been advising drivers to plan for significant delays, especially on weekends. And that remains true for Labor Day. Creating a safe work zone on I-90 near Snoqualmie Pass required us to split westbound traffic in order to continue to let vehicles through. 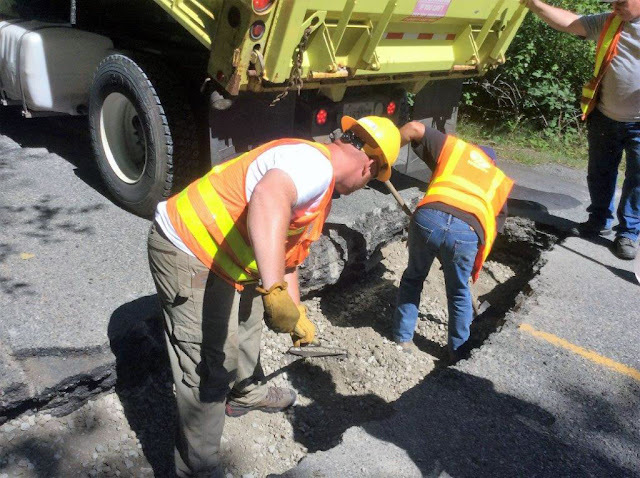 While we pick up most of our construction work zones across the state on most holiday weekends, in the case of some of the projects on I-90, that isn’t possible. That means the traffic shift on westbound I-90 between the summit of Snoqualmie Pass (milepost 52) and North Bend (34) due to a major bridge deck repair project will still be in place Labor Day weekend. Why can’t we remove the traffic control? When it comes to bridge decks, once you’ve started, there’s no turning back. The work has to be finished, which is why this detour has been in place 24/7 since we started in mid-June. All three of the bridges we’re working on have sections where the deck has been removed and it isn’t safe to put traffic on the unfinished driving surface. 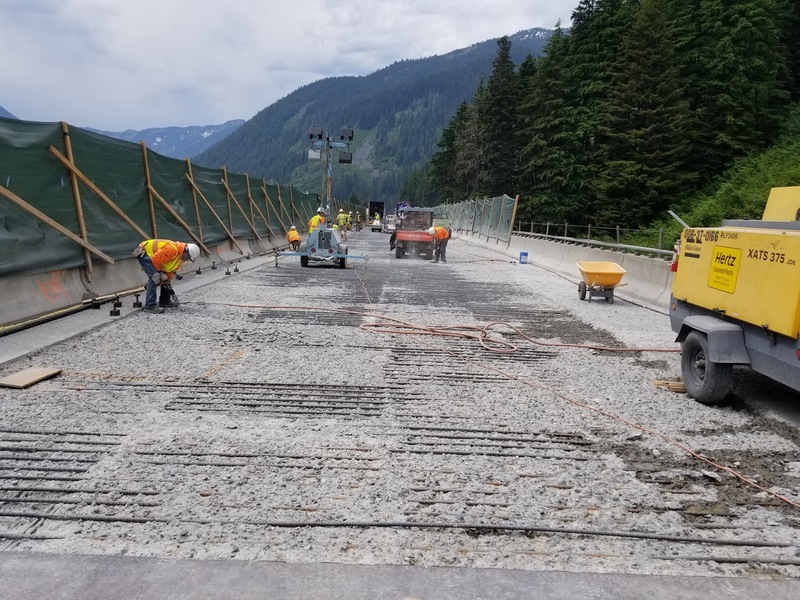 With parts of the I-90 roadway near Snoqualmie Pass torn up for bridge deck repair, it’s not safe to allow vehicles to travel over those areas. Our goal was to have the detour removed in time for Labor Day weekend but construction can be unpredictable and issues came up that delayed that. The contractor’s schedule fell behind due to some contractual issues as well as labor disputes that made delivery of concrete difficult. The contractor has been working 21 hours a day over two shifts, six days a week (there’s a three-hour window they can’t work due to environmental regulations) to try to get this work done before the wet and cold season arrives. Repairing the bridge decks on this stretch is no easy task. It requires removal of the top layer of the bridge deck using high-pressured waterblasting tools. Once the top layer is off, the bridge is assessed for damage or areas that need to be repaired. Then crews pour a layer of concrete, which cures for seven days. 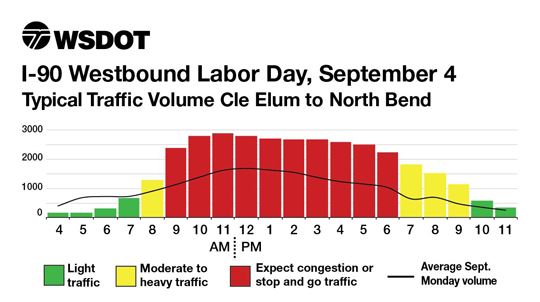 A look at the best and worst times to travel on I-90 during Labor Day weekend. In order for this work to be safely done, the westbound lanes are reduced from three lanes to two, with one of those two shifted around the work zone. So one lane continues on in the westbound direction, and the other detours around the construction site via an eastbound I-90 lane. device by clicking the red icon on the travel maps page. Every weekend we see heavy traffic on eastbound I-90 on Fridays and on westbound I-90 on Sundays. This will be true again Labor Day weekend, though the heaviest traffic westbound will likely be Monday. We recommend that drivers planning to use I-90 travel early in the day or late at night if possible to avoid the heaviest times of congestion. Please note that we also expect to see slow downs near Cle Elum due to work replacing old pavement on that stretch of highway. Be sure you and your vehicle are prepared for potentially long waits if you travel during peak travel times. Have a full gas tank, food and water available and be sure your vehicle is in good working order. Check travel conditions before you head out and stay informed throughout your travels by using our online tools – but not while you’re driving, of course. 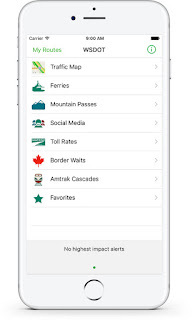 You can also access our Labor Day best-times-to-travel charts on our mobile app by clicking on the red icon at the top of the screen on our traffic map. If you plan on using other mountain passes like US 2 as alternatives, understand that other people are planning that as well. Again, this is a very busy travel weekend and it’s likely you’ll find congestion in most areas if you travel during peak times. And finally, please be sure to keep all debris - especially flammable debris - in your vehicle. We've already seen lots of roadside fires this summer and we hope we can avoid seeing any more. We understand that this is frustrating to travelers and we regret that this construction zone is still in place. 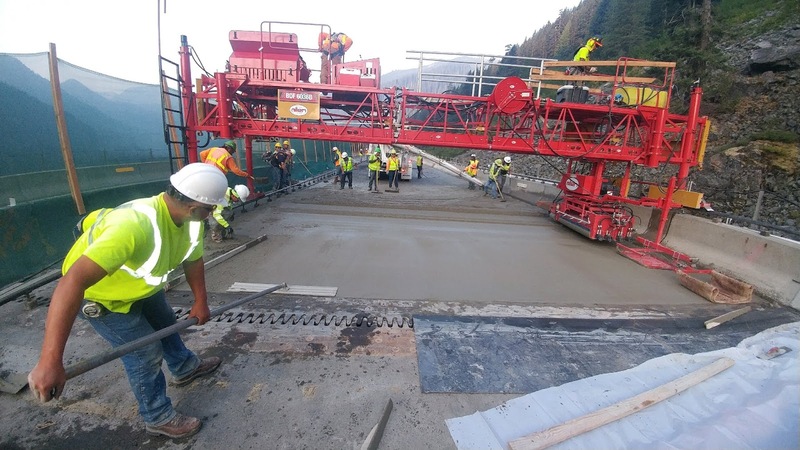 This is important work and it has to get done in a limited amount of time before weather conditions change in the passes and we appreciate your understanding and cooperation as we work to get these projects complete. Communicating information to the public is a vital part of our agency’s mission. Everything from sending out day-to-day traffic reports to updating project statuses to giving the public an inside view of some of the work we do – it’s all important in letting people know just what’s going on in our agency and on the highways. We know travelers depend on this information and we work hard to share it in as many ways as possible. was named the best DOT video channel in the country. So it’s always rewarding when we’re recognized for those efforts. Earlier this week we learned that we’ve been awarded first place in three categories at the annual TransComm Skill Contest awards, handed out as part of the American Association of State Highway and Transportation Officials convention. We also received two runner-up awards. For the second time, our mobile app was named the best among DOTs nationally at the annual TransComm convention. This marks the fourth year in a row we’ve won three awards from TransComm, and we have won at least two awards in each of the past 10 years. This is a testament to the skill our communications team shows in providing timely, creative information to keep the public informed. Our “Stay Back from the Tracks” safety campaign put on by our Rail Division, which won first place in the Public Involvement Approach category. Our mobile app, which won first place in the Mobile Web Application category. Our YouTube channel, which won first place in Best Video Channel. Our Tracking Bertha beneath Seattle effort was runner-up for the Excel with a Consultant category. A picture of Bertha was runner-up in the Photo category. While we’re proud of the work and recognition of our communications team, we’re always looking to get better. What would you like to see us do more of, or do differently? What type of information do you find most useful? What’s the best way we can get information to you? Stay Back From the Tracks safety campaign. If you're planning to catch the ferry between Bremerton and Seattle on Friday to cheer on the Hawks at CenturyLink Field, you may want to use alternate routes or make it a full-day celebration if you can! 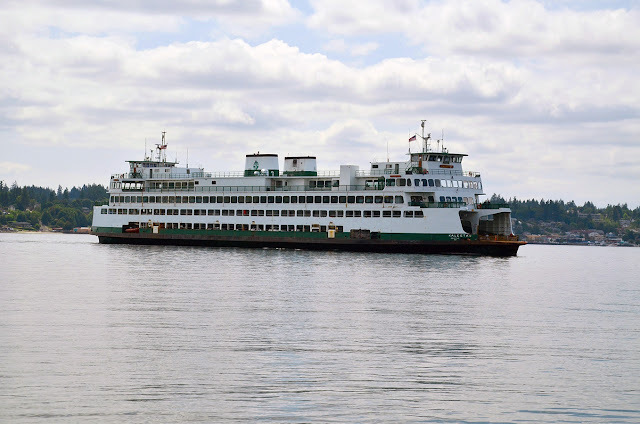 With the Kaleetan running on half power and reduced speed due to maintenance issues, our 12:20 p.m. departure from Bremerton and 1:30 p.m. from Seattle will be canceled again to make sure we start the afternoon commute with an on-time schedule. Because the Kaleetan is running on half power, riders should plan ahead for longer trips until the boat can be repaired. As a result, we are anticipating a large amount of walk-on passengers on the 1:45 p.m. Bremerton departure on the Chimacum. 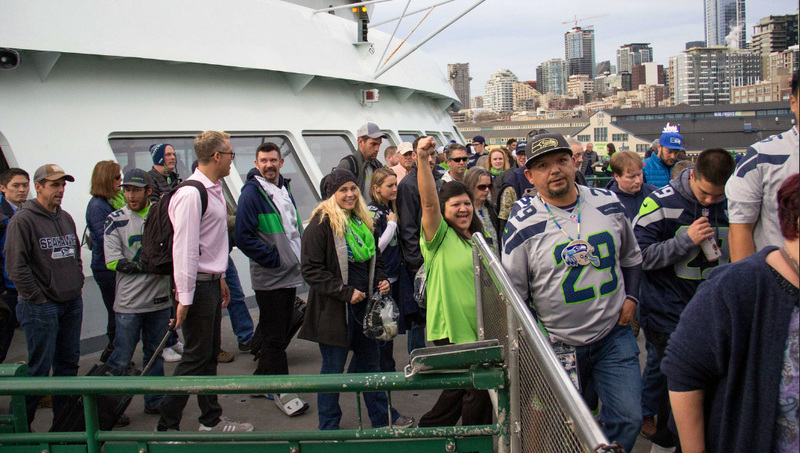 The 3 p.m. sailing may also be packed with 12s, who will be cutting it close if they hope to see kickoff at 5 p.m. Depart Bremerton on our 11:10 a.m. sailing (or earlier). Depart Bainbridge Island on our 2:55 p.m. sailing (or earlier). Depart Bremerton on Kitsap Transit Fast Ferry 3:25 p.m. sailing (walk-on only). should plan ahead and take earlier sailings if possible. Because of Kaleetan's slower speed, all of its evening departures are delayed. Our 9:05 p.m. Seattle departure has been running about 40-50 minutes late this week. The Chimicum is scheduled to leave Seattle at 10:30 p.m. Friday and 12:50 a.m. Saturday. Fans also have the option of taking a ferry to Bainbridge Island. Our last departure is scheduled for 1:35 a.m.
Don't even consider the 5:30 p.m. Bremerton to Seattle sailing on the Kaleetan Sunday if you want to make it to the 7 p.m. Sounders match on time. On reduced power, that departure will be delayed and arrival may not be until after kickoff. When will the Kaleetan be repaired? We currently do not have a spare vessel to replace the Kaleetan on the Seattle/Bremerton route. Plan for this modified schedule to continue until another boat can be brought in so the Kaleetan can be repaired. Follow our ferries Twitter account, travel alert bulletins and Vessel Watch for real-time updates. Customers can also sign up for email or text updates. Don’t get caught in a jam, plan ahead! We all know sitting in traffic is not child’s play, especially when you are trying to get to your fun weekend plans. To help navigate around another busy traffic weekend, we thought we would bring in the most adorable toddler ever to guide you. We’ve also included our latest Microsoft Paint map with this weekend’s major closures and events. You know, in case you want to print it out and hang it on your fridge. Up to you. The best way to avoid a traffic-related tantrum? Plan ahead. We have several resources at your disposal that help you know what is happening on the roads before you leave. In just a few short days, the new State Route 520 West Approach Bridge North is opening to full capacity for the first time. At 5 a.m. on Monday, Aug. 28, westbound drivers will take their inaugural drive in two new general purpose lanes, and carpoolers and transit riders will see their HOV lane extended farther west from the floating bridge to the new lanes. Just weeks after last month’s opening of the new westbound off-ramps, we’re on track to open the general purpose and HOV lanes as the second of three major project milestones in 2017. The final milestone? 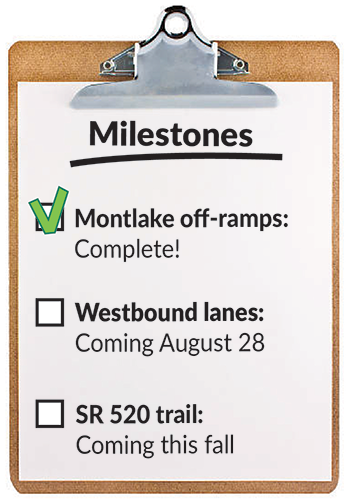 Later this fall we will open the SR 520 trail from the floating bridge to Montlake - giving bicyclists and pedestrians a new, safe route across Lake Washington. Drivers headed west across Lake Washington will experience a few changes to their traffic patterns come Monday morning. Three lanes will carry traffic from the floating bridge west into Seattle – two general purpose lanes and an HOV/transit lane. The HOV lane will extend the current westbound HOV lane west from the floating bridge. The HOV lane will end east of the westbound exits to Montlake to make space for the transit-only lane and the new location for the westbound SR 520 transit stop at Montlake Boulevard. Transit riders will have a new platform under the 24th Avenue East Bridge. You won’t miss it — you’ll use the same path to connect to/from Montlake Boulevard. Crews need time and space to prepare the new bridge for vehicles. To complete the work necessary to open the new lanes, SR 520 will be closed in both directions from 92nd Avenue NE to Montlake Boulevard from 11 p.m. Friday, Aug. 25, to 5 a.m. Monday, Aug. 28. So this weekend, drivers needing to cross the lake should use alternate routes like I-90. Taller, noise-reducing traffic and pedestrian barriers. Solid, instead of hollow, columns. Seismic isolation bearings that reduce the risk of damage in the event of an earthquake. 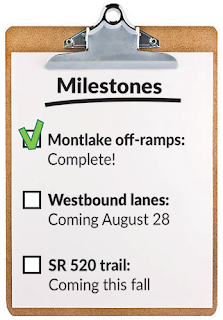 Early Fall 2017 – Restripe eastbound SR 520 to add an HOV lane east of Montlake. Late Fall 2017 – Open the SR 520 trail connecting Montlake and Bellevue. Beginning of Montlake Phase (late 2018) – Shift both east and westbound traffic onto the new WABN structure while we construct the new West Approach Bridge South and Montlake lid. In these final months of West Approach Bridge North construction, we’d love to interact with you more. The first new @WSDOT_520 follower on Twitter that mentions this blog will win a free SR 520 Grand Opening hat. Good luck! Did you know that weekend traffic is a lot like baking? You need to plan things out in advance, have a lot of patience and be prepared for some setbacks. But just like that first bite of that fresh-out-of-the-oven cookie, cupcake, or brownie, reaching your final destination is oh, so, sweet. This weekend, construction and major events are creating the perfect recipe for packed highways and travel delays. To get you ready, check out our latest video on what could slow you down on the roads. Warning: you may want to eat a cupcake afterward. Mix ingredients until just combined for packed roadways and slower travel times. Bake in 75 degree mostly sunny weather. While baking, prepare yourself by checking the WSDOT Mobile App, the WSDOT traffic twitter accounts, or our website. Once baked, give yourself extra travel time before enjoying your destinations. There is still plenty of other things happening this weekend that could impact your weekend travel. Below we have the latest edition of our popular Microsoft Paint maps, along with a list of other notable events. So, you’ve packed your vehicle and made a plan to view Monday’s eclipse. Before you leave, check out these safety tips to help ensure a smooth trip. Keep your gas tank full – fill up regularly along a long trip to guard against long lines or some stations in Oregon running low on gas. Bring extra food and water as well as a first aid kit and any mediations you may need. Bring or print out a paper map of where you’re headed. Cell systems may be overloaded, which could knock out GPS directions. Protect your eyes. You can’t look at a partial or transitioning eclipse without special safety glasses – regular sunglasses aren’t enough. (However do not drive with the glasses on – you only need them when looking directly at the sun). Be fire wise. Don’t pull your vehicle on brush or grass – the heat can ignite a wildfire – and never throw cigarettes or other lit material from vehicles. Always obey closure signs during evacuations. With just a few days until the Great American Solar Eclipse on Monday, Aug. 21, are you ready? Whether you're traveling to Oregon to see the total solar eclipse, checking out the partial eclipse here in Washington or just going about your normal errands you'll likely notice different traffic patterns this weekend and on Monday. Central Oregon was already seeing traffic backups and fuel shortages Wednesday evening at the start of an eclipse festival. With up to 1 million people expected to travel to Oregon, we expect increased traffic throughout our state as people make their way there and back. If any significant congestion or closures happen, we'll post details here. weekend through Tuesday as people in Washington make their way to and from the viewing sites. So, how bad will traffic be? What's the best route? And when is the best time to leave? Unfortunately, we don't have a crystal ball. This isn't an event where people buy tickets or register travel plans. Based on hotel and campground registrations and anecdotal information about people's plans, though, we do expect traffic to be heavier than normal throughout the weekend as well as Monday and Tuesday as people return. to help stay safe during Monday's solar eclipse. 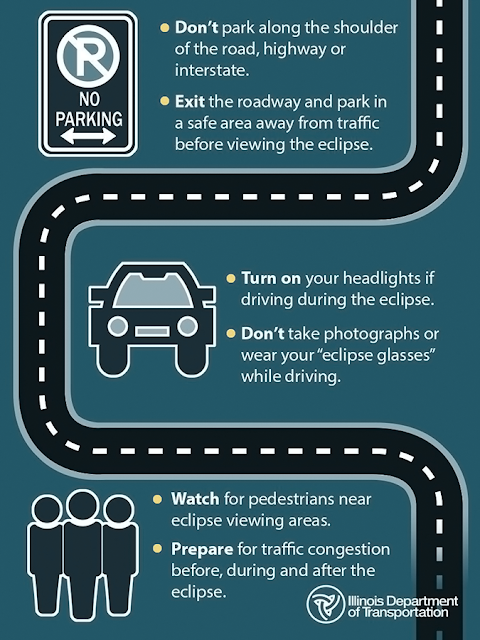 Do not stop in roadways or on the shoulder to view the eclipse. This is illegal and unsafe and could delay emergency vehicles from doing their job. Give yourself extra travel time or alter travel times if possible. If traveling to the eclipse, bring extra water, food and other necessary supplies. You may be in your vehicle longer than normal and you need to be prepared. Do not operate a vehicle while wearing your eclipse glasses. That's not what they were designed for. Have a plan. Trying to attend the eclipse last minute is not a good idea and likely will be unsuccessful given expected heavy traffic. Stay informed. 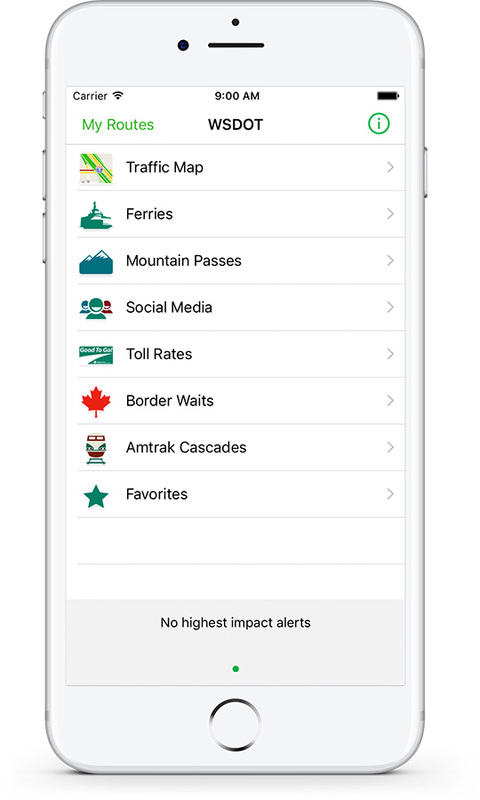 Use our tools such as the WSDOT app, travel alerts page, Twitter accounts, traffic cameras and this blog to stay in the know. There's certainly a lot of excitement about the eclipse, but please prepare and stay safe so that everyone can enjoy the experience. 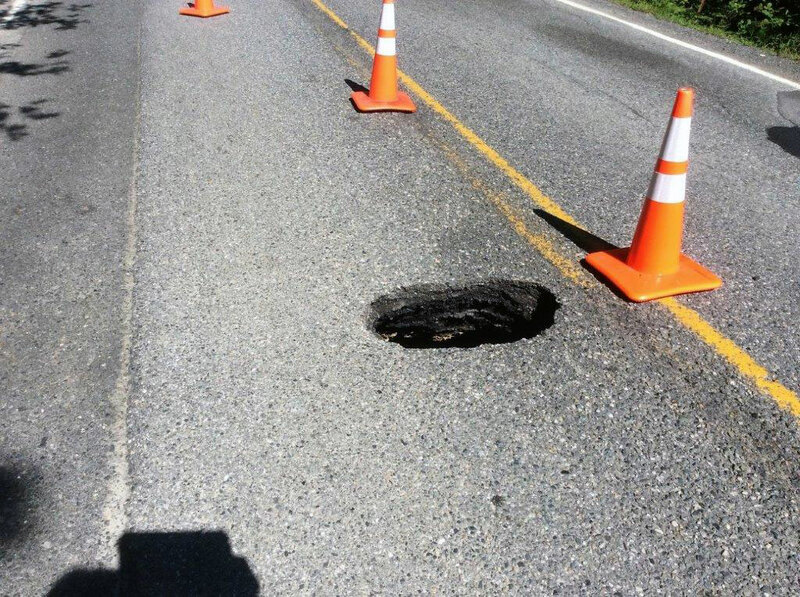 A couple of different sinkholes have closed down our roads this summer. One of the most recent, on Monday, July 31, 2017, was on State Route 534, which runs for about five miles through Skagit County near Lake McMurray and Camp Korey. While small, this road is very important to those who live and work in the area. 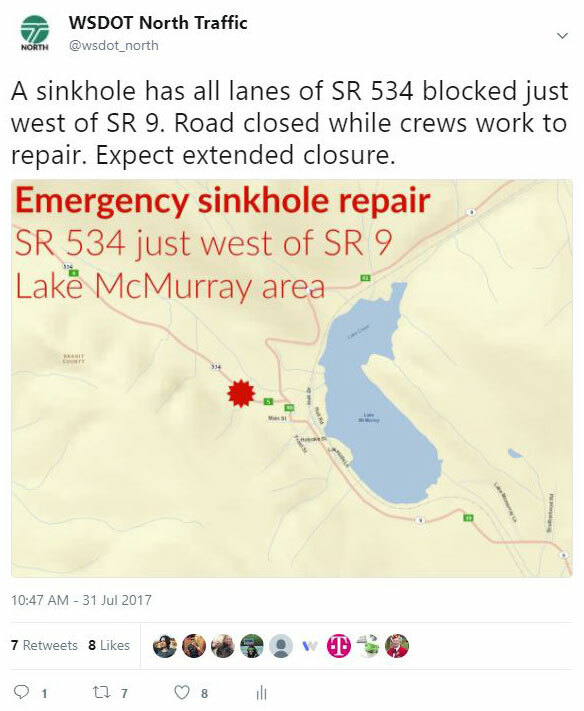 It is a busy truck route and connects neighbors in the Lake McMurray area and along SR 9 with I-5. This sinkhole started as what might be described as a dimple in the road. A little sunken area that most of us probably wouldn't have noticed. Luckily our maintenance teams did, though! 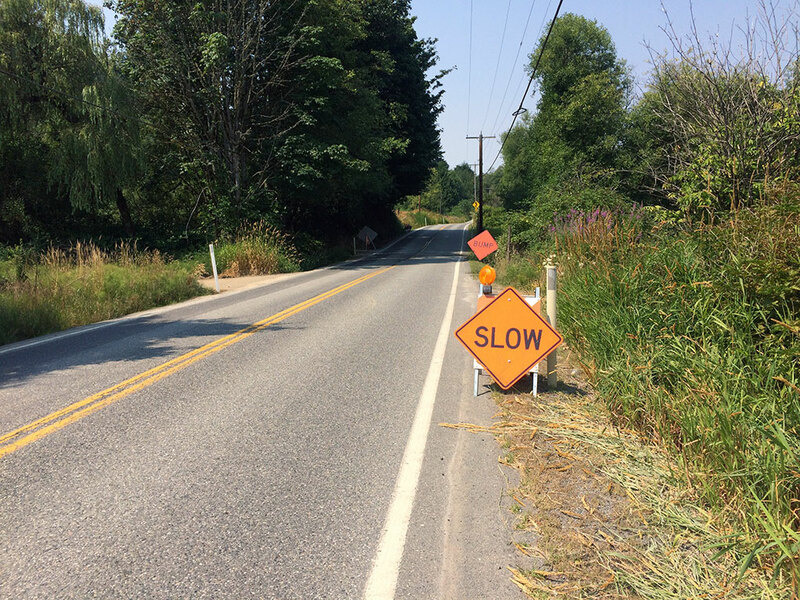 Lead technician Doug Knott, and his team were heading to a project on SR 534 when they noticed that the area just didn't look right. They stopped to investigate and quickly realized that this little void wasn't quite so little. The crew closed the road and coordinated with our communications staff to get the word out to the public about this closure. It was important that we let travelers know quickly that the detour during the repair was expected to last most of the day. Then Doug and his team got to work. They opened up the dimple, revealing the sinkhole, and then kept digging. They determined that the issue was a leaking culvert right under the highway that was washing away the roadbed, leaving nothing for the asphalt to sit on. The crew dug up all the damaged area and prepared for a temporary repair. They moved in gravel to fill the area and then added asphalt back to the road. Thanks to Doug and his crew for their sharp eyes and hard and quick work. They were able to reopen the road in less than five hours and while we know some folks were forced to take that long detour, the quick work by the team meant that afternoon commuters didn't need to alter their routes. 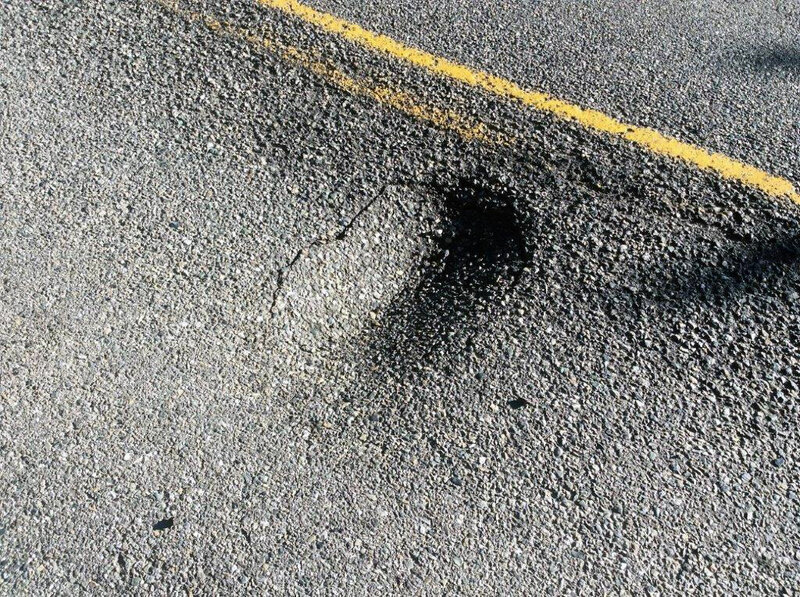 There is still a dip in the road where the temporary repair is so you may see signs warning drivers to slow down and be ready for it. Now plans are being made for a permanent repair which we don't have work hours scheduled yet, but I'll let you know when we do. 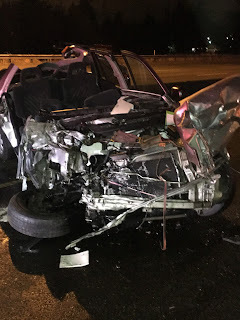 If you drive on Interstate 405 near downtown Renton, you may have noticed a lot of activity happening on the hillside to the south of the freeway. You may have even asked yourself, "What is that funny looking machine hanging over I-405?" Well, we have been hard at work this spring and summer constructing the I-405/SR 167 Interchange Direct Connector Project. We've already completed some early milestones, such as relocating a noise wall to protect our neighbors from construction noise and shifting traffic to create safe work zones. In early July, we began mass excavation of the hillside near the Talbot Hill neighborhood. We have been moving dirt in this area to prepare once again to shift lanes of northbound I-405 to the south and create space for the future flyover ramp. But this isn't your average dirt-moving project. Originally, the mass excavation was scheduled to take approximately three months. Trucks would have been hauling 80,000 cubic yards of dirt 24 hours a day, seven days a week through city and neighborhood streets. That is equal to 2,500 truckloads or eight Goodyear blimps of dirt! An innovative way of moving dirt on our I-405/SR 167 project is saving time, money and fuel. Instead, the contractor came up with a creative alternative. The team cut out a hole in an existing retaining wall and installed a conveyor belt, that funny looking machine that was hanging over I-405, which loaded dump trucks with dirt and allowed them to exit on Smithers Avenue South via northbound I-405, avoiding driving the whole route through city and neighborhood streets. We realize that construction can be an inconvenience for drivers and nearby residents, which is why we're always looking for ways to minimize effects that people experience from our projects. By carrying out this innovative plan, our contractor saved approximately a week and a half of time, minimized construction noise and traffic issues on neighborhood streets, and conserved fuel. The next construction activity you will see is crews repaving roughly six miles of southbound SR 167. Then we will move on to setting girders for a new I-405 bridge over Talbot Hill and the first stages of work to help improve fish passage in this area, which are scheduled to begin sometime next spring. For the latest construction closure information, please visit our I-405 Construction Updates page and our King County Construction Updates page. When the I-405 express toll lanes opened nearly two years ago, it stirred up a lot of strong feelings. But we had learned from feedback about the SR 167 HOT lanes that public support would improve with time. Though some drivers continue to express frustration, over time we’ve heard more and more positive comments about the express toll lanes as well. We wanted to hear directly from customers, so we visited the Bellevue Good To Go! customer service center to talk to I-405 drivers and ask what they thought about the express toll lanes. We heard a mix of opinions. Some customers said the express toll lanes worked great and they liked having the option, and others said they didn’t see the benefit and only used them when they really needed to get somewhere on time. We also conducted a survey in June 2017 to help us find out what people are thinking about the express toll lanes. The survey represented drivers who have used any part of I-405 in the past year and who lived throughout Snohomish and east King county. About half of respondents said they had used the express toll lanes, and half had not. It used a diverse online panel and had a ±4.8% margin of error. Sixty percent of people told us that they like having the option to use the express toll lanes for a faster trip. This represents a complete flip in opinion compared to the surveys we did when the express toll lanes were brand new. 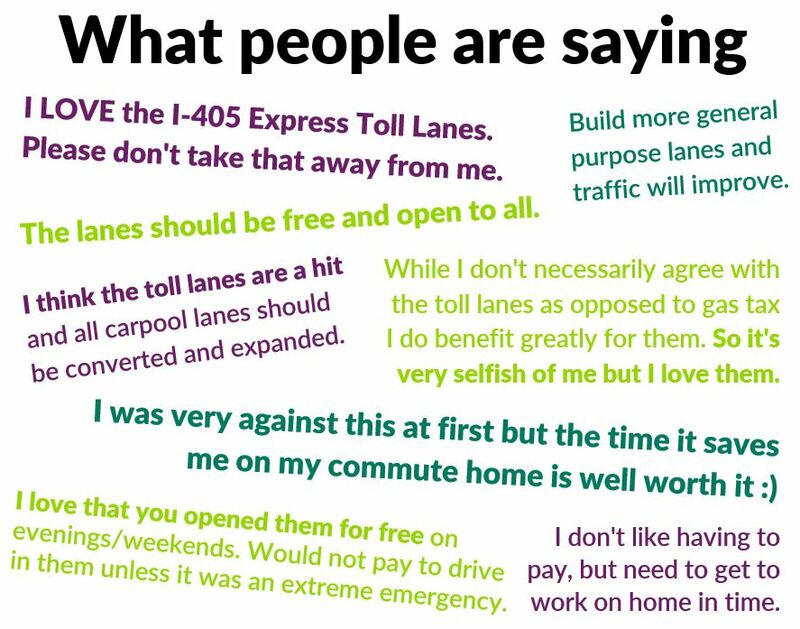 When we asked people what they thought of the express toll lanes in January 2016, three months after they opened, 77 percent of people told us they did not support the project. Today, two-thirds of those surveyed agree that the express toll lanes help reduce congestion in the regular lanes, a complete change from January 2016 when 77 percent of people we surveyed thought the opposite. The answers to these questions were consistently positive among people of all incomes, ages, and genders. Despite the growth in popularity, there are still people who feel as strongly as ever that the express toll lanes are a bad idea. Not everyone who liked having the option to use express toll lanes loved every aspect of them. For example, only a third of people agreed that tolls are an effective way to reduce congestion, which shows that a lot of people still have mixed feelings about these lanes. Please continue to let us know how you feel about the express toll lanes. Your feedback – positive and negative – is important to us and helps us make improvements to the system. Updated Aug. 25, 2017 to correct that the January 2016 survey found 77 percent opposition to express toll lanes, not 87 percent. Big changes are in store for one of the busiest and most congested intersections in the city of Lake Stevens. 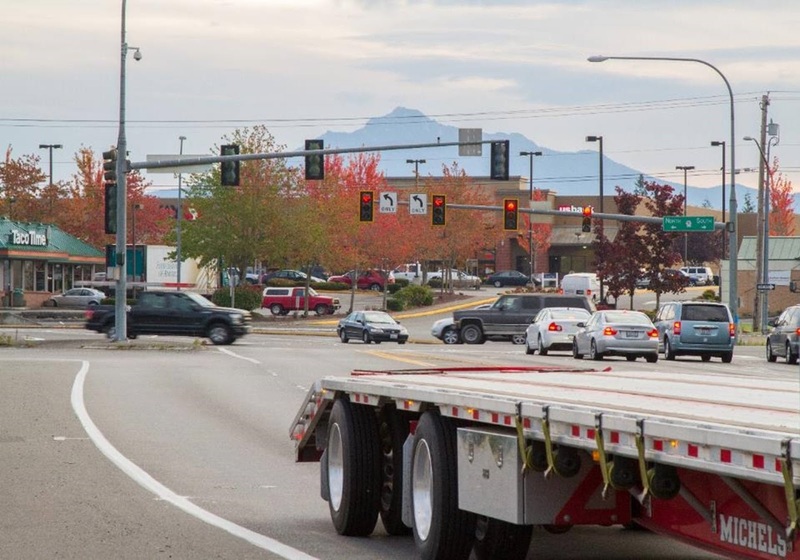 Next week, our SR 9/SR 204 Intersection Improvements project team will host an open house to share the recommended design to address the congestion at the intersection. The open house will take place from 6-8 p.m. on Wednesday, Aug. 16 at Hillcrest Elementary School in Lake Stevens. A presentation will begin at 6:15 p.m. We’ll have staff available to chat about the design and next steps. The busy intersection of SR 9 and SR 204 in Lake Stevens will be undergoing some big changes in the next few years. Throughout the past year, we have worked closely with the SR 9/SR 204 Intersection Improvements project Stakeholder Advisory Group (SAG), reached out to business owners and the Lake Stevens community to develop and assess design options that will create better connections for all roadway users of this intersection, including pedestrians, transit riders, bicyclists and drivers. The advisory group is comprised of business owners and representatives, elected officials, transit and multi-modal agency representatives and residents who met seven times throughout the past year, starting in summer 2016. We worked closely with stakeholders to define a project needs statement; develop, analyze and review potential practical solutions and reach consensus on a preferred alternative design for the intersection. 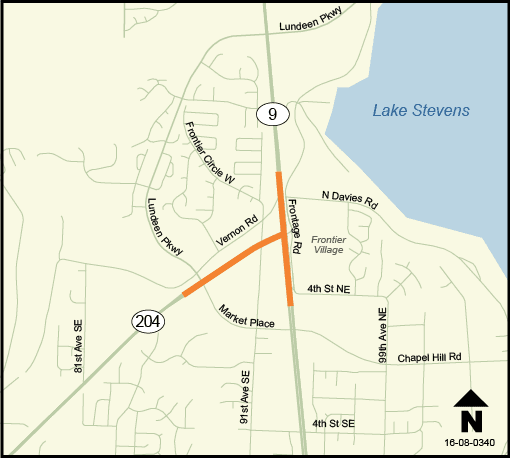 An open house to discuss changes to the SR 9/SR 204 intersection in Lake Stevens will be held on Wednesday, Aug. 16. Following the upcoming open house on Aug. 16, we will brief the Lake Stevens city council on the recommended design and continue to move the project forward. We’ll also continue to work with stakeholders to address any ongoing or new concerns moving forward. The $69.5 million project is funded by the 2015 Connecting Washington transportation package. Construction is scheduled to begin by 2019. Get ready for what could be one of the busiest travel weekends we ve seen all summer! Not only will there be a ton of construction work happening around the Puget Sound area, but there is also a bunch of fun events going on. Translation: prepare for packed roads. One of those fun events is the Mariners Edgar Martinez Weekend, and we thought, who better to help us spread the word about the expected traffic ahead than the beloved Mariner Moose. He may not say much in this video, but he sure knows how to get the point across. The Moose only scratched the surface of what s happening this weekend. 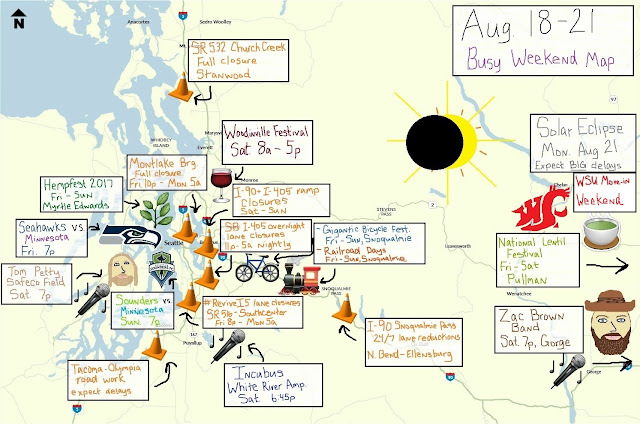 As you can see in the map below, we barely had enough room to cram in all of the road work and big events. Bottom line: give yourself plenty of time to get where you need to go and expect to experience some delays along the way. I m going to Friday s Mariners game, so you better believe I ll be leaving early to get there. Don t want to miss out on getting an Edgar bobblehead! It s a light bat! I will survive the Great American Solar Eclipse! I've never seen a solar eclipse, but I hear from those who have that there are no words to accurately describe just how cool it really is. Imagine if you will, a sunny day turning dark; the streetlights kick on and it seems like nighttime for at least a couple minutes! Now the last time this happened in the northwest, "I Will Survive" by Gloria Gaynor was approaching the top of the music charts in 1979. Indeed this solar eclipse is back from outer space, and we've pulled together a guide to help you survive a potential cosmic traffic jam, avoid crying and hold your head up high. Say it with me: "I will survive, hey, hey!" 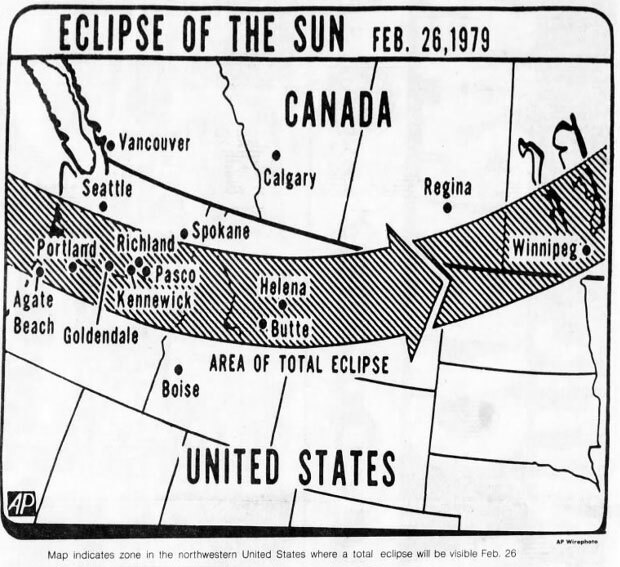 of totality the last time a solar eclipse was visible in our part of the country. As with any large-scale event, planning ahead is key. The eclipse is expected to happen on Monday, Aug. 21 but emergency services and transportation agencies are anticipating an influx of people Aug. 18 – 22. 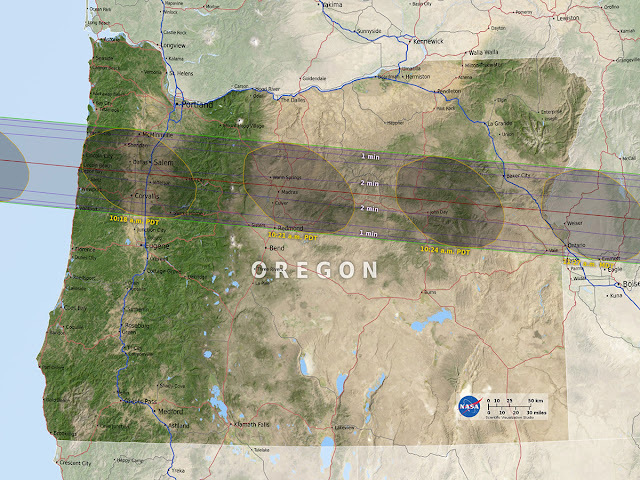 The state of Oregon is expecting roughly a million people to travel to the path of totality. These are places where the entire sun is blocked from view by the moon for about two minutes. The unknown variables are: Where are those folks coming from, where are they going, and when are they leaving? The answer is, we really don't know. Some are expected from within the Beaver State, while others are presumably coming from Washington, Idaho, California and even British Columbia. It's tough to tell with certainty, and the timing of this is hard to pin down. This map from NASA shows where the path of totality is expected to be when the solar eclipse happens on Aug. 21 of this year. Of course, this all depends on what people decide to do. Waking up early to leave the Seattle area to head south the morning of the eclipse is not a good idea. The word from our friends at the Oregon Department of Transportation for folks making the trip is to "Arrive Early, Stay Put and Leave Late." Safety first: Unless it's an emergency, do not pull over to the shoulder of the highway. And no, viewing the solar eclipse does not constitute an emergency. However, you can inadvertently create one: hot vehicle undercarriage + dry grass = potential brush fire. Let's avoid that, K? Plan ahead: Make sure you're prepared for several days, and your vehicle is in good working condition to avoid a potential breakdown. Know before you go: Before you hit the road, check our mobile app, travel alerts and traffic cameras to see how things are moving. When you're behind the wheel, have a passenger with fast thumbs do the work. We can still see a partial eclipse in Washington, so if you decide to stay put, please find somewhere safe and remember to wear those funky eclipse glasses to protect your eyes – but not while you're behind the wheel! Because remember, you still have your life to live. You will survive! August is a beautiful time to camp – or glamp - here in Washington. The weather is hot and dry and water has actually warmed up enough that chickens - like myself – will spend more than a few minutes enjoying the cool down. 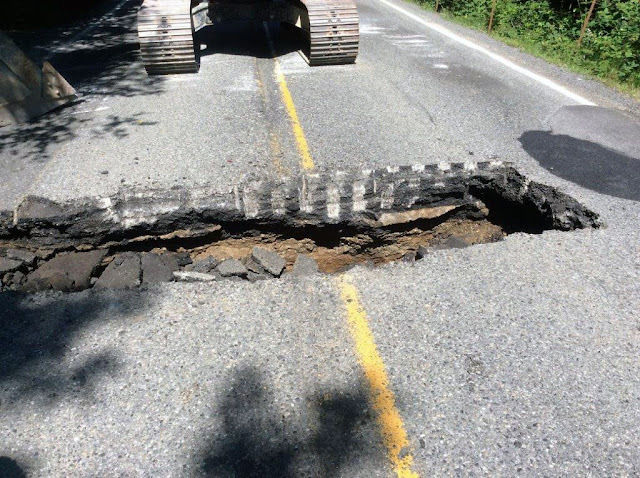 If you’re hitting a Camano Island state park, other campground, rental property or your own home to enjoy some time on the beach, plan ahead for a State Route 532 closure beginning 8 p.m. Friday, Aug. 11 and lasting for approximately two weeks. Church Creek, where the SR 532 closure will happen, is just east of the Stanwood Haggen. 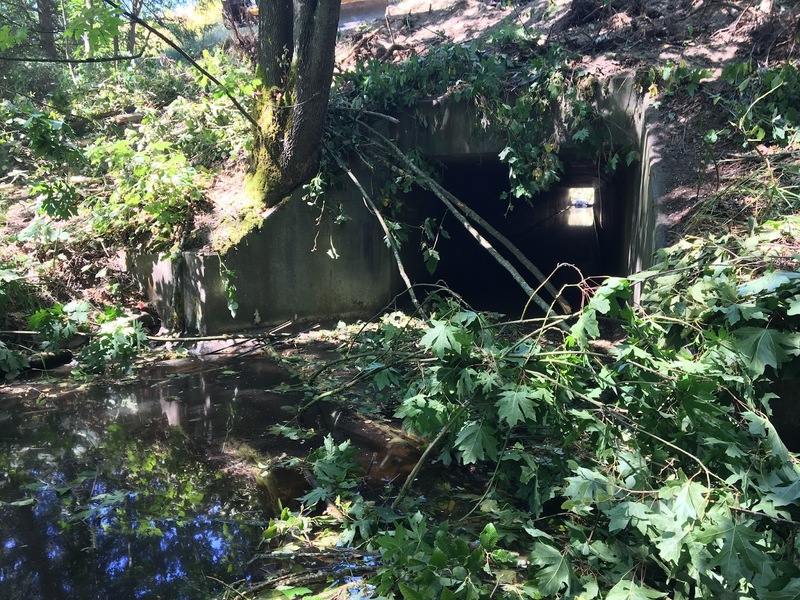 Our contractor crews from Strider Construction will close the highway to install a new, larger culvert under the highway just east of the Stanwood Haggen. Crews will replace the current culvert with a larger one to improve stream flows for salmon, trout and other aquatic species. The work is part of a $6 million fish passage project to help restore the creek bed to a natural state and improve fish passage for salmon, trout and other aquatic species. The crew has already built a temporary bypass road that will help detour traffic during this work. Those with precise packing skills who are able to fit family and stuff in a passenger vehicle will have a short detour around this closure. 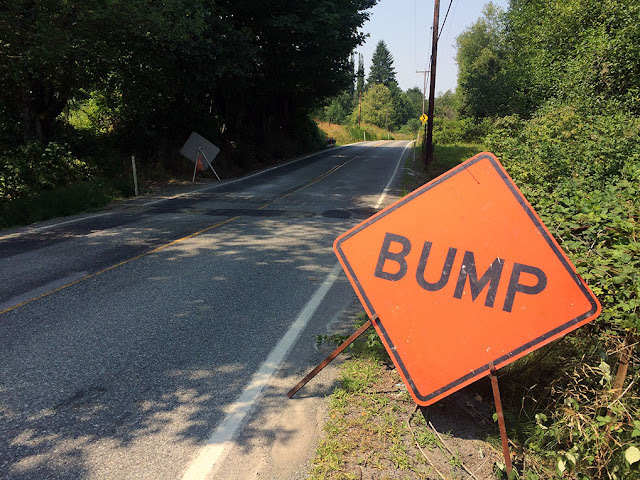 Westbound travelers will go right on 36th Avenue Northwest, left on 268th Street Northwest and connect back to SR 532 before the Haggen/Stanwood Camano Village shopping center through the temporary bypass road. Eastbound travelers will curve left to the temporary bypass road from SR 532 east of 72nd, continue on 268th Street Northwest, go right on 64th Avenue Northwest and turn left onto SR 532. Travelers will want to remember that this detour takes you along county roads with lower speed limits and rural family homes so please, slow down and be aware of people leaving driveways, plus children and pets that might be in the area. Going for the glamping weekend away? If you drive an RV or long 5th wheel with a wide turning radius, you’re going to want to take the truck detour during this closure. 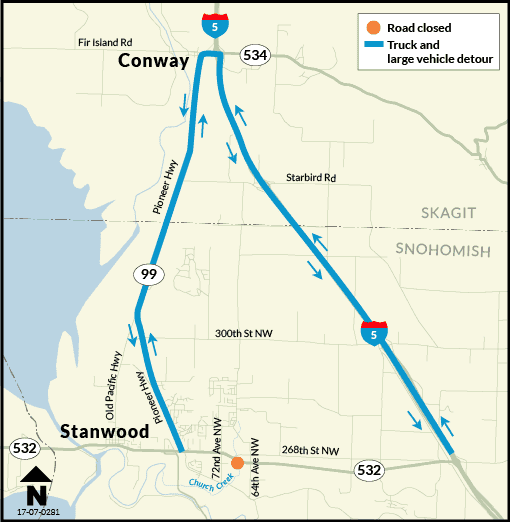 Trucks, RVs and other big vehicles will use I-5 to exit 221, travel west on SR 534 toward Conway, through the roundabout and south on Pioneer Highway. This detour will add about 10 miles to most trips. Trucks, RVs, glampers and others with vehicles that require a wide turning radius should use the detour through Conway. Leaving all your motorized vehicles at home? 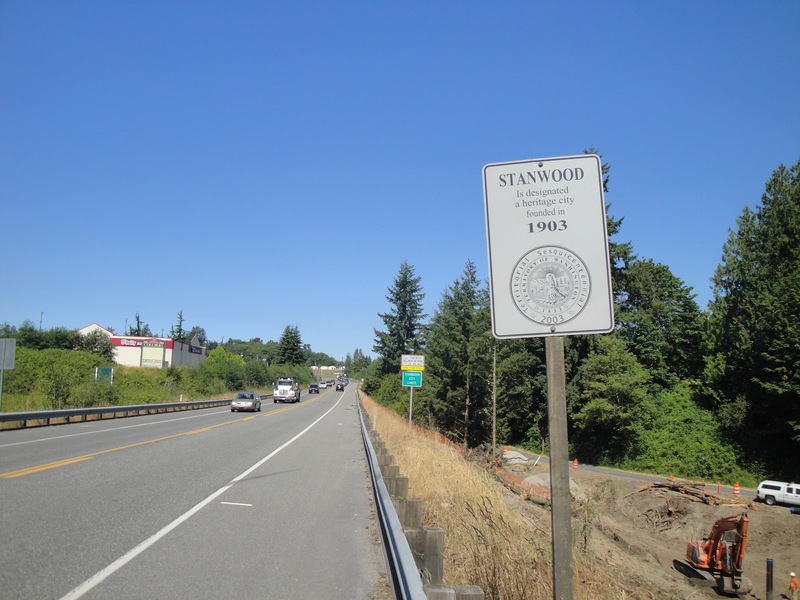 Cyclists heading to or from Stanwood or Camano Island can use the detours mentioned above, but should be prepared for higher traffic volumes on narrow roads. We don’t know the exact date the closure will end due to uncertainty over a pipe location and how the groundwater might affect the excavation, but we’ll keep travelers updated on the work through our social media accounts and through Island County emails. We’ve worked closely with the community to balance this closure between allowable environmental dates and big events in the area. 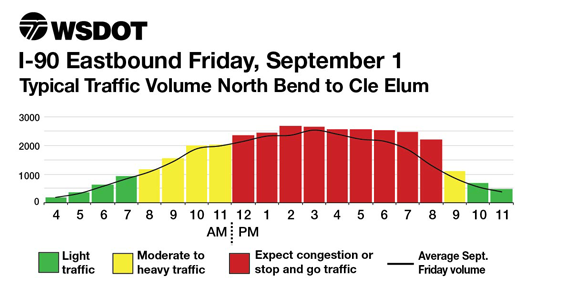 Plan for delays in or out of Stanwood or Camano Island by allotting extra time into trips. Follow the posted speed limits. Most passenger vehicle detours are 35 mph and the temporary bypass is a 25 mph road. Know that the detour routes will be busy and drivers could be sharing the road with cyclists. Share this closure information with friends and neighbors. Check for updates throughout the closure on the WSDOT north Twitter account. We know not everyone trying to hustle up the kids and dig up the camping gear - that may have been tucked away since last summer – is focused on road closures. If you know someone heading this way, please spread the word. While the detours will get everyone where they need to go, it might take a little bit longer. We don’t want you to be late for the start of that annual horseshoe tourney you and your friends throw every year! Our busy – and hot – summer construction season is entering the final stretch and crews are working to get as much done before the wetter months of the year get here. This is especially true of our cross-state highways and people using US 2, I-90 and US 12 will want to plan for extra travel time across the mountain passes. Construction and maintenance work will cause delays for those heading east and west. Among the projects are paving work on US 2 in Sultan and just outside of Leavenworth, traffic shifts and detours on I-90 from North Bend to Cle Elum for a variety of bridge deck repair and paving, and roadwork on US 12 White Pass. The length of delay varies depending on traffic and if there are any collisions or stalls so be sure to plan plenty of extra time and be sure you and your vehicle are prepared for any potential lengthy delays. We're always looking for ways to save taxpayer money. During the planning phase of a project, we focus on an important question: Can we deliver this work more efficiently? The answer, as planning ramped up for demolition of the Alaskan Way Viaduct, was yes. And so we shifted gears by combining three previously separate projects into something much bigger – a super-sized effort that will demolish the viaduct, permanently close the Battery Street Tunnel and restore street connections across Aurora Avenue North, near the new SR 99 tunnel's future north portal. 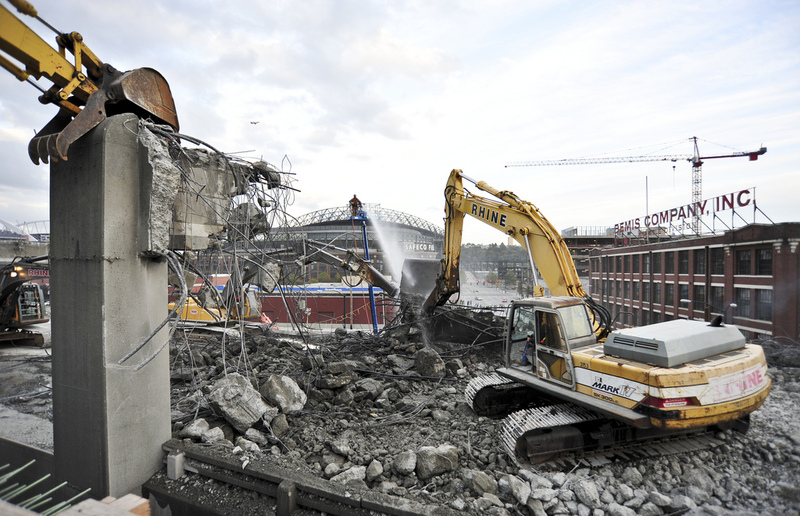 Workers carefully demolish the Alaskan Way Viaduct’s southern mile in 2011. While we know many of the key parameters for this work, we'll know more details next year, after the contractor that will perform the work has been selected and develops a plan. You can read about and comment on the guidelines for the demolition by visiting our online open house, which runs through Aug. 14. We're also hosting an in-person open house on Aug. 10. The Battery Street tunnel will be decommissioned and sealed as part of the new SR 99 tunnel project. The name says it all: This is the project that will carefully bring down the remaining section of the viaduct. The viaduct was built in the 1950s to carry roughly half the number of vehicles it carries today. After the 2001 Nisqually Earthquake, we repaired and strengthened the viaduct, but the structure is showing its age. While it remains safe for daily use and is inspected twice a year, it remains susceptible to damage or collapse in a future earthquake. Demolishing the structure could take up to nine months. Crews will perform the demolition in sections to minimize disruptions. 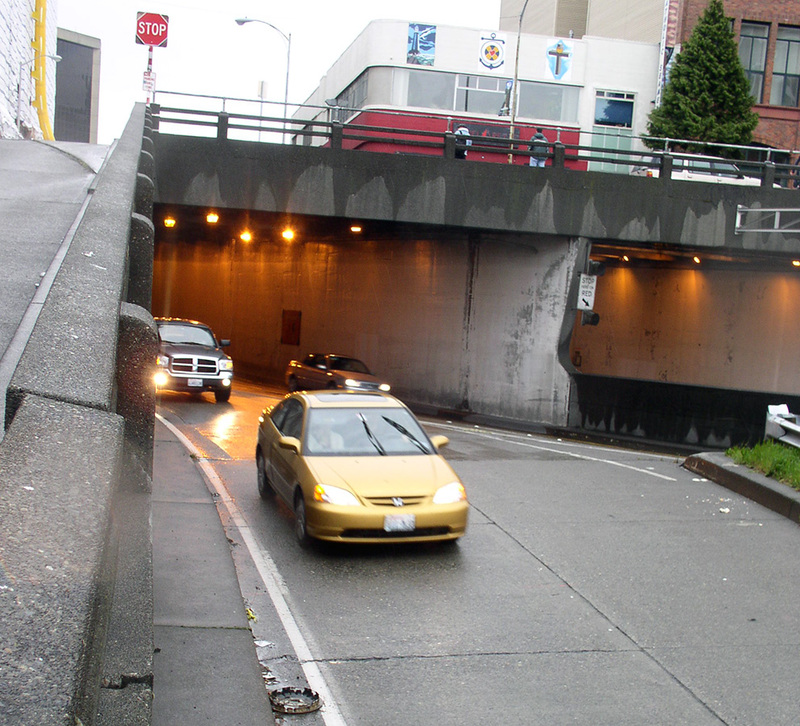 We will decommission and permanently close the Battery Street Tunnel as part of this project. This is necessary because the Battery Street Tunnel was built in the 1950s and, like the viaduct, is beyond its useful life and is seismically vulnerable. Its electrical and mechanical systems are difficult to maintain and do not meet modern safety requirements. Decommissioning work includes disconnecting, removing or relocating tunnel systems, and cleaning soot and vehicle exhaust residue as needed. The tunnel will then be filled in and permanently sealed. 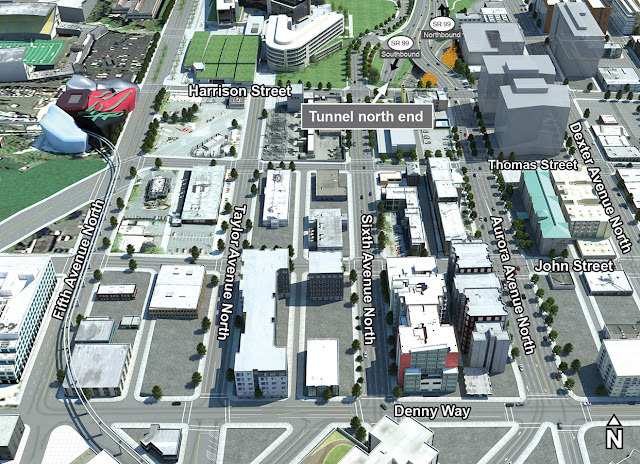 Finally, the contractor for this project will be responsible for reconnecting the local street grid across Aurora Avenue North, near the SR 99 tunnel's north portal. Harrison Street will open across SR 99 when the tunnel opens to traffic; the other two intersections will open as work is completed under this contract. These improvements will provide greater connectivity between neighborhoods and alternative options for travelers. This rendering shows the streets reconnected across Aurora Avenue North. Why use a single contract? There are several benefits associated with packaging these three projects into one design-build contract. Combining the work reduces the risk of having three contractors sharing the same construction zone. Reducing the number of contractors also lowers administrative costs associated with managing the work. As an added bonus, by using the design-build contracting method rather than a more traditional design-bid-build contract, we enable the contractor to design the project as construction progresses, rather than having a complete design prior to construction. The bottom line is that we expect to deliver all three projects approximately one year earlier than we could have if they were delivered as separate contracts. That means the viaduct comes down sooner, the City of Seattle can begin its long-awaited transformation of the downtown waterfront, and we save taxpayers money be getting our work done sooner. The Blue Angels are in town this weekend, Aug. 3-6. In order to keep the pilots and public safe, the I-90 floating bridge will be closed while the Blue Angels practice and perform at the Seafair Air Show. Check out our video for details. 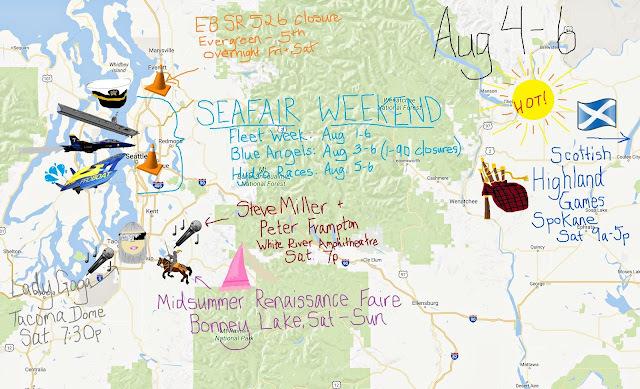 For more information, you can also visit our Seafair webpage. 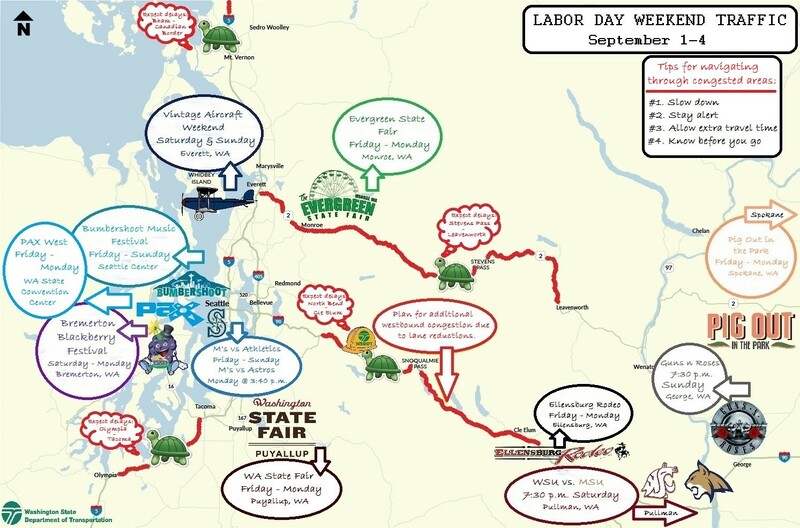 Besides the Seafair Air Show, many other events and construction projects are also taking place. 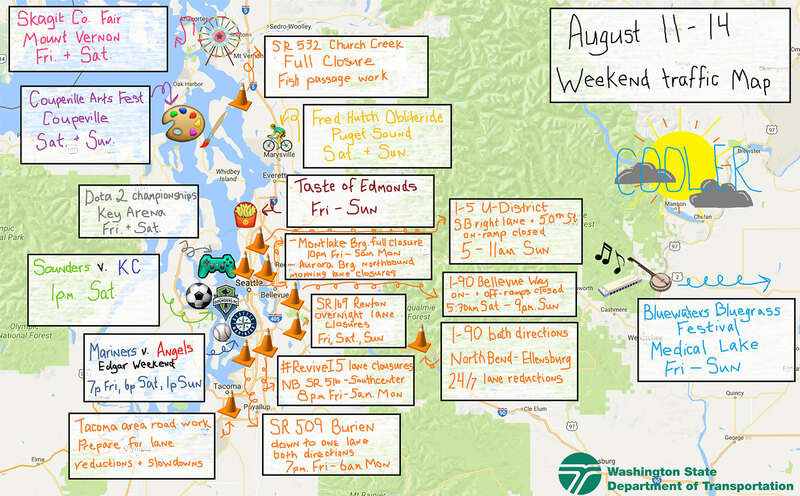 Check out our weekend events map below for a rundown of the festivities. I built a deck for my house a few years ago. With a project like that you can take your time, buy your materials piecemeal and get several deliveries, upping the cost. Maybe take a month or two to complete the work, so your yard's a mess for a while. Or maybe you're like me – buy everything at once, get one big delivery to save money and attack it with 10- to 12-hour days. Whether you're building a deck or refurbishing the region's major interstate, the principles are the same. You can take your time and increase the cost, or you can plan ahead, power through and save money. 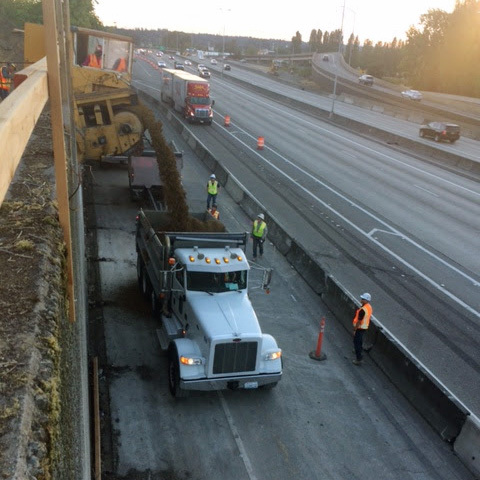 We are using an aggressive schedule on our #reviveI5 project on northbound I-5 between South 260th Street in Kent and the Duwamish River in Tukwila. That means working weekends with lane closures. We've paved several layers of asphalt on four miles between SR 516 in SeaTac and South 170th Street in Tukwila during five weekends since the start of June. We have one more weekend for paving scheduled for Aug. 11-14, weather permitting. One weekend-long lane reduction for paving equals 30 nights of lane closures. 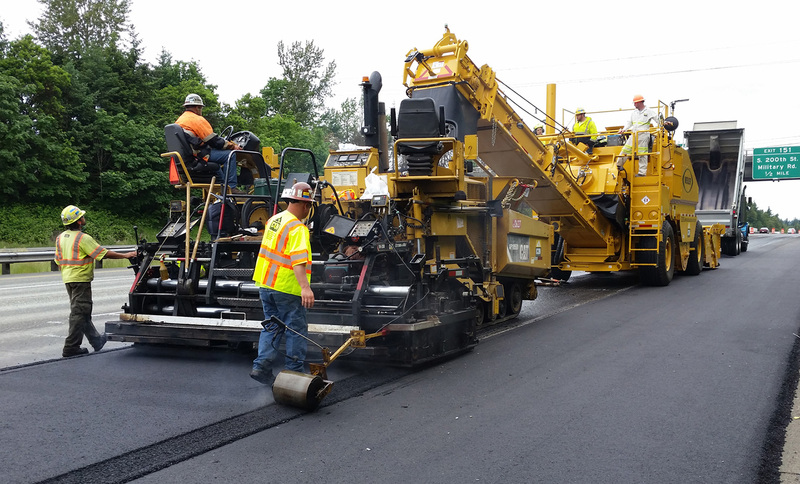 We have six weekends for paving – that's 180 nights of work – six months. Paving a long section during a weekend saves money – and lots of time. And remember, we can't pave any old night. We need dry conditions and temperatures above 45 degrees to pave. That could mean two to three years to finish paving if we didn't use weekend closures. That would tie up crews and equipment and run up costs. Instead, we'll finish paving in a couple of months this summer. In addition to paving, we need four weekends to replace eight expansion joints: four at the Interurban Avenue overpass and four at the Duwamish River Bridge. We'll replace the Duwamish River joints the weekends of Aug. 18-21 and 25-28. 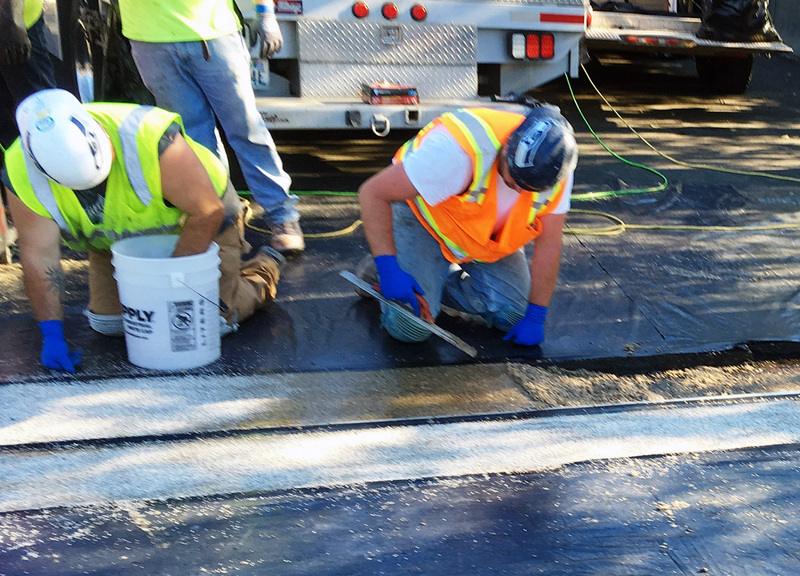 We're still working to schedule when we will replace the expansion joints at Interurban Avenue. Replacing expansion joints during a long weekend lane closure is much more cost-efficient. Like paving, we could replace these large expansion joints using only overnight closures. People can do just about anything if they put their minds to it – and are willing to dedicate enough time and spend enough money. However, doing expansion joints that way would create weeks or even months of traffic disruptions, the finished product would not be as strong and the cost could be ghastly. When I was out there sweating away those long days building that deck, I'd sometimes think, "Ugh, why am I doing this?" A few days after I finished and was eating dinner with my family on my new deck, I thought about the money I'd saved and realized I could still be in the middle of construction. The short-term pain of finishing in a quick, cost-efficient manner is definitely worth it.